Chinatown Plaza on Moonta Street in the Adelaide CBD has recently undergone a 3.5 million dollar renovation and On The Chopping Board (OTCB) had the opportunity to tour the unique, eye-opening and stunning food hall. All food and beverages were provided on behalf of Chinatown Plaza. 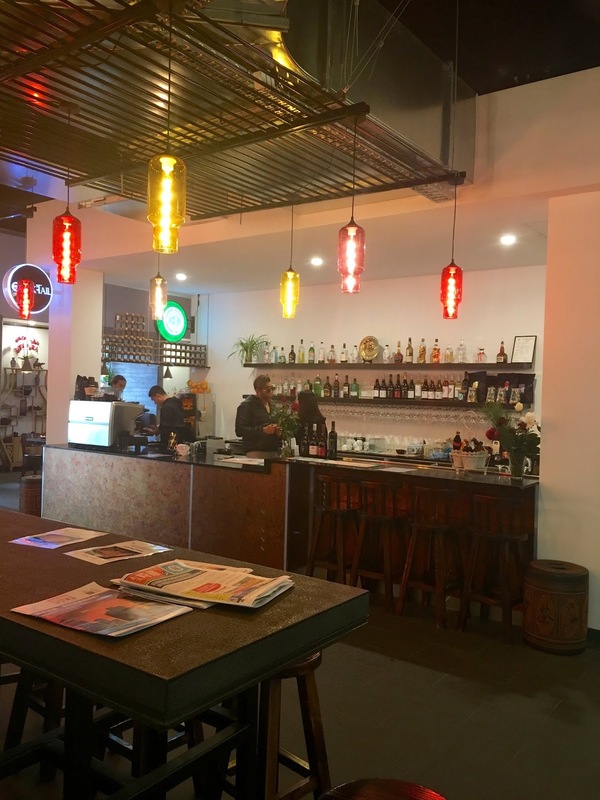 Chinatown Plaza has sourced a number of top chefs to create eight mouth-watering food stalls covering a variety of cuisines, and a bar serving up all your non-alcoholic and alcoholic beverages. 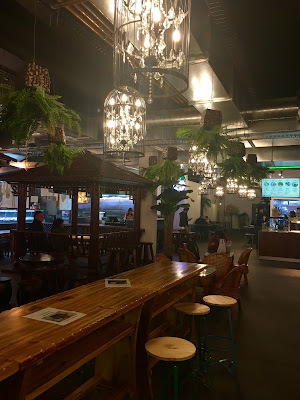 On this visit we were able to fit in a generous tasting from four stalls, all sourcing good quality local produce to make this food plaza stand out from the ordinary foodcourt crowd! First up one for the meat lovers! The BBQ plate can come in different meat combinations including a duo or trio of meat served with steamed rice, plum sauce and sour spicy long green beans - but today we added a fourth meat, the Chinese sausage. This sausage was a Cantonese/Hong Kong style sausage that wasn't spicy and more similar to an Italian salami. It was so fresh, tender and full of flavour we were so happy it made the plate as it was nothing like the tasteless shrivelled up sausages of our past! 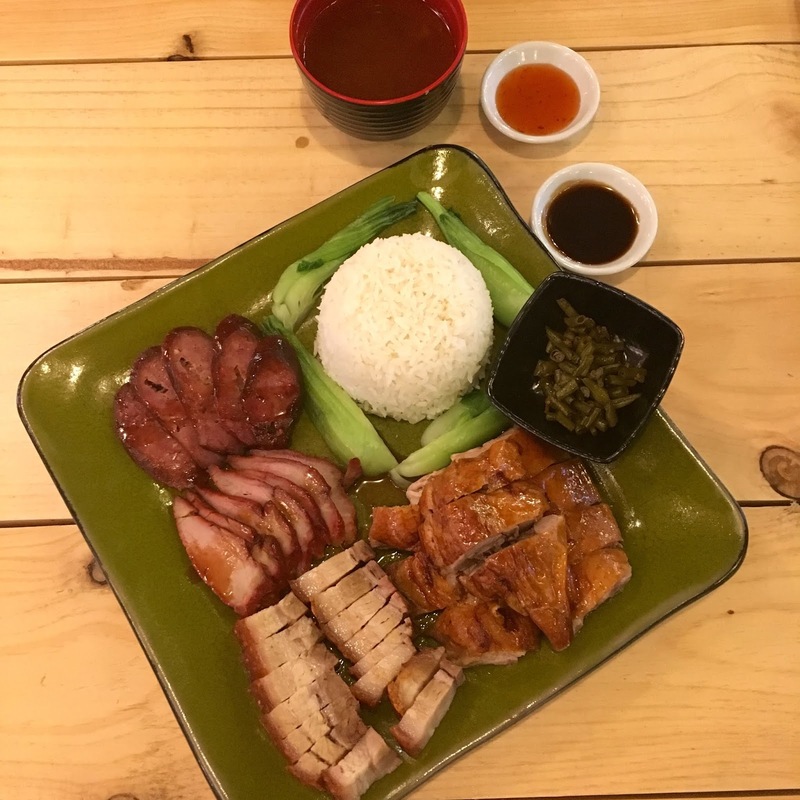 The BBQ pork was also tender and juicy and the roast pork belly had that crunchy skin outer that brings a smile to our face especially when it is paired with a moist tender meat. The roast duck was prepared beautifully as the simple, fresh flavours and juicy tender meat shone through. The duck is a highlight here and we are informed that Chinatown Plaza is one of only food halls that roast the duck themselves fresh on site. 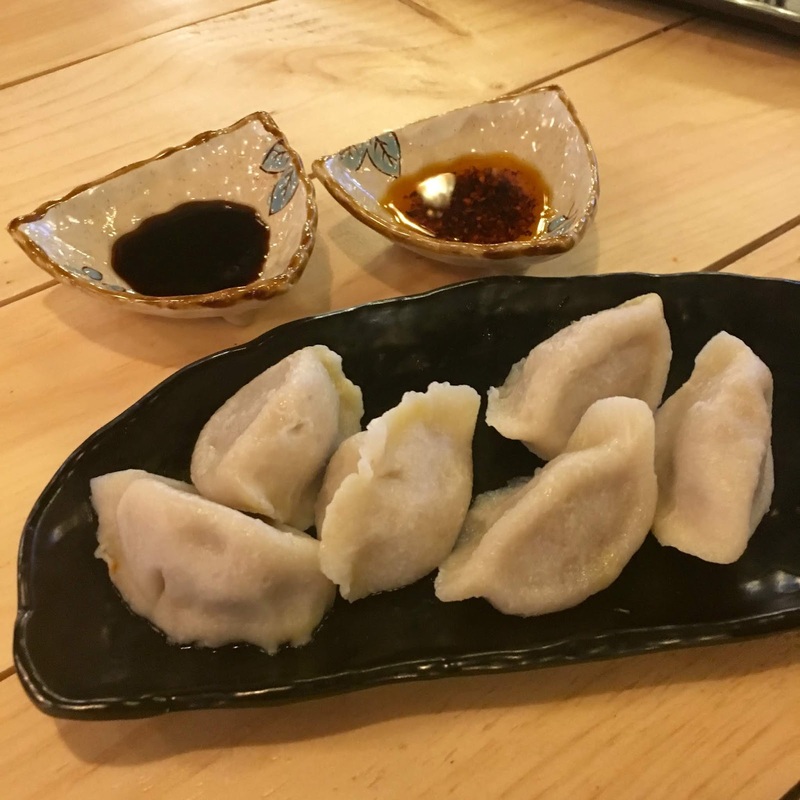 We loved all the food we tried on this visit but the handmade dumplings made on-site fresh everyday were the absolute standouts for us! We tried both the beef and carrot dumplings and the pork, prawn and chive dumplings. Biting into our first dumpling instantly made us realise how different freshly made dumplings are. Firstly they were packed full of real flavour – we could taste the carrot and because it wasn’t processed to a pulp, we could actually crunch on the thinly chopped carrot pieces producing a lovely texture with the beef mince. Secondly, the dough of the dumpling wrapper was a little more rustic and thicker but lovely and soft with just enough bite and hold to keep the filling and flavours packed in tight. Thirdly, the dumplings are a lot larger so they kept us more satisfied. We didn’t think we would be able to finish 12 dumplings with all the other dishes we tried on the visit but as they were super delicious we could not bear to leave one behind! These are a must try and we hope the dumpling makers can keep up with the demand. Up next was a taste of the Yum Cha stall in the plaza, serving up all your favourite bite-sized Chinese delicacies cooked in bamboo steamers. 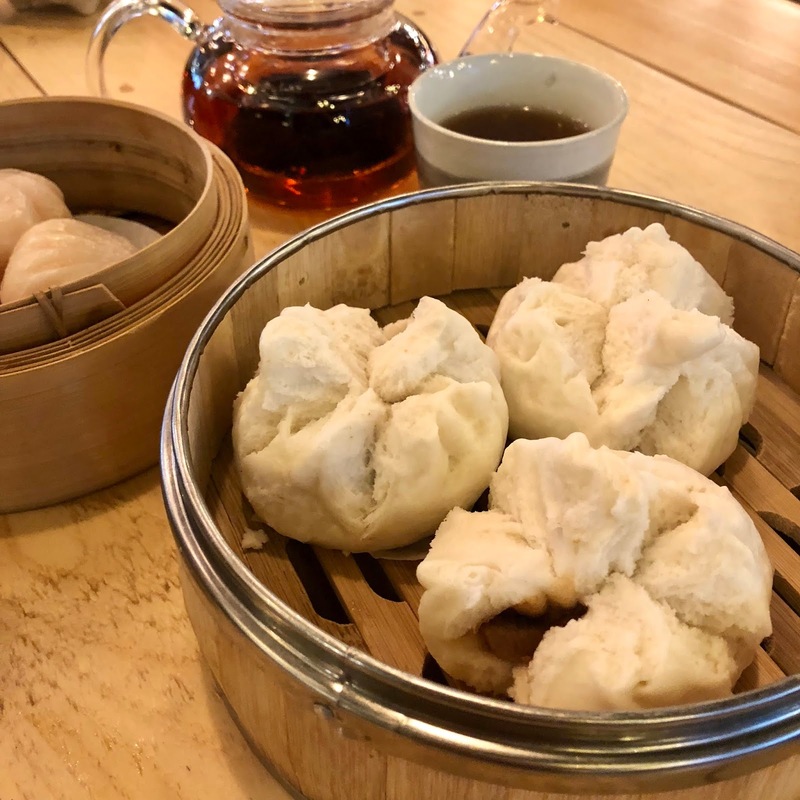 While sipping on Chinese tea we tried two yum cha dishes, the prawn dumplings and steamed pork buns. The slightly chewy, translucent wrappers of the prawn dumplings enveloped a juicy and flavoursome filling of South Australian prawns, putting these dumplings up there with some of the best we've had in Adelaide. The steamed pork buns followed in the same footsteps - the snowy white dough slightly cracked on the top exposed a delicious BBQ pork filling that wasn't too sweet. We will definitely be coming back to taste the rest of this Yum Cha menu! Travelling south from China to Malaysia, our last dish to taste in the Chinatown Plaza was an Assam Laksa, the famous laksa from the Malaysian island of Penang. 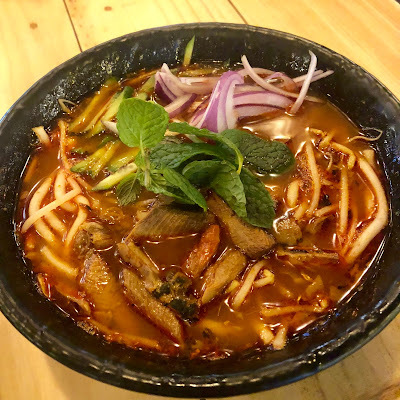 Unlike the well-known and loved coconut milk based Malaysian curry laksa, the foundation of Assam laksa is a broth made from fish, tamarind, chilli and ginger. The slightly sour and extremely fragrant soup had a strong fish flavour, but was not too overpowering. However, you'd better be able to handle some heat to enjoy this laksa, as the chilli packs a punch! The noodles served in the soup were also different to a standard laksa, with large, round rice noodles that provided great chew and texture, and were also more filling. Garnished with Vietnamese mint, fresh red onion, fresh cucumber and crunchy bean sprouts, it was fantastic to taste a different style of laksa that we hadn't tried before. We would definitely recommend the Assam laksa to any laksa or noodle soup fan! With all our meals today we sipped on the glutinous rice Chinese tea, which we are informed is sourced from a high quality tea brand and very different to your everyday tea you find at your local Chinese restaurant. Not expert tea drinkers, we enjoyed this tea and the nutty, earthy and almost rice like flavours coming through. Worth a try! It's fantastic to see such a stunning and truly transforming renovation of one of Adelaide's most loved, iconic food destinations. From the furniture and crockery to the highly regarded team of chefs, everything in the Chinatown Plaza has been hand-selected to create an authentic Asian dining experience whilst making the most of our great South Australian seafood, meat and fresh produce. 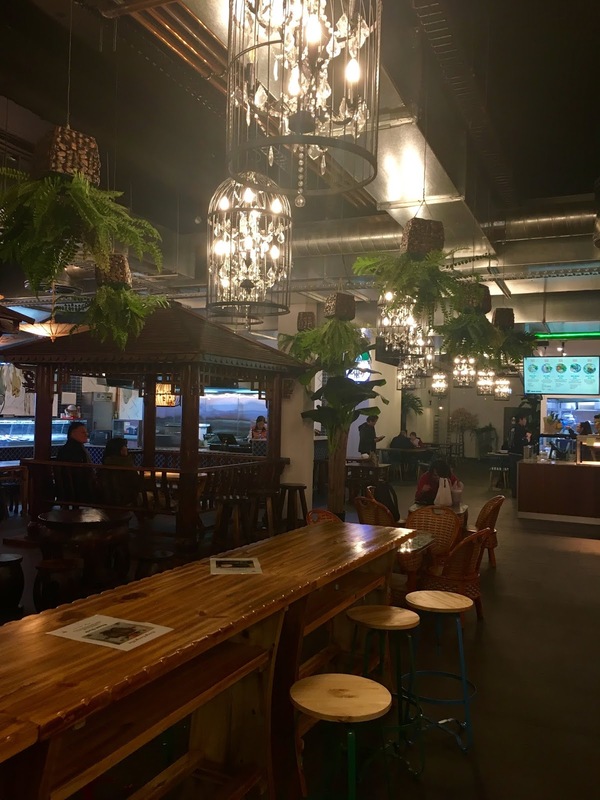 Whether it be for a quick lunch break or a Friday night dinner with friends, make sure you check out the new Chinatown Plaza for a feast to remember! The Chinatown Plaza is open from 11am, 7 days per week.